Last weekend I met up in London with some delightful people from the Tiny Owl Knits group on Ravelry. We had a blast, wandering around the city getting up to mischief with a tiny viking. The yarn crawl was an amazing experience, not only because I got to visit a bunch of new-to-me yarn shops, but also spending a day with some very fun knitters and crocheters. 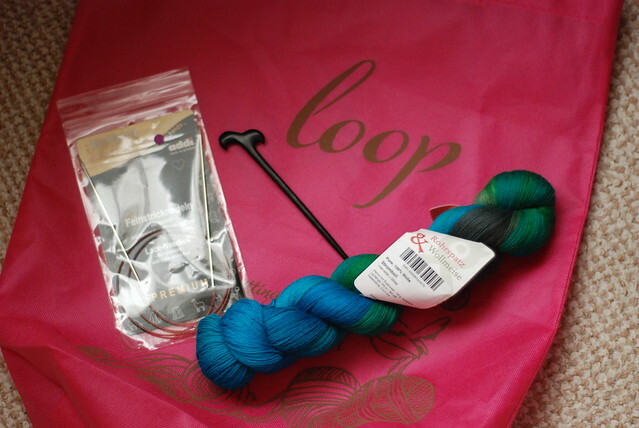 I got a little something from each of the shops, but managed to come home with only one skein of yarn (some Malabrigo sock from Nest) - at the other shops I picked up notions and bits & pieces, including some Lego stitch markers from Prick Your Finger and some much-needed darning thread from Loop. 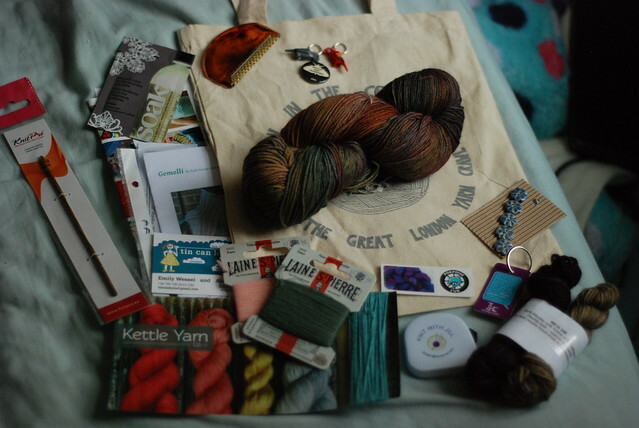 There were also loads of goodies provided by generous sponsors in our goodie bag :3 I can't wait for the second yarn crawl later this year! Returning to the present... Last week's TOK adventure reminded me of the crawl because I ran into a few of my fellow yarn-crawlers, and we visited two of the shops that my group had crawled: Loop, and Nest. I also got a beautiful wooden shawl pin and a set of Addi circular needles - flexible cables, sharp tips, and smooth nickel-plated finish - what are marketed as "sock rockets" in the US. The tips are respectably pointy, though not as lethal as my HiyaHiya sharps. Time will tell whether these become my new favorite needles. After Loop and a pub lunch, we visited Nest, which I might go so far as to call my favorite London yarn shop. It's small but manages to pack in a wide range of yarns and notions, and the atmosphere is very inviting. The only downside is it's a bit difficult to get to, tucked away in Crouch End. However, it is well worth the journey! This time around at Nest I picked up another beautiful skein of Malabrigo Sock (likely to become a shawl), in the devastatingly beautiful colorway Archangel - a gorgeous layered blend of red, orange, and purple. 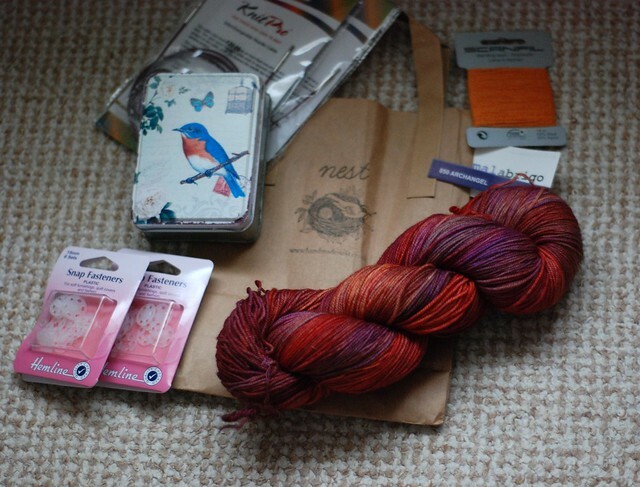 I also got some clear snaps for cardigans, some KnitPro cables, more darning thread (can never have too much, nor in too many colors), and a sweet bluebird tin to keep it in. After Nest, we still had some time before shops started closing, so we headed off on foot towards the Handweaver's Studio in Seven Sisters. I had never visited this shop before, but wow, am I glad I had the opportunity! When you first step into the shop, you are surrounded by bags overflowing with combed top, in all manner of colors and fibers. There's an extensive selection of spinner, weaving, and textile-related books on the shelves, and that is before you even reach the shelf upon shelf upon shelf of coned yarn of just about any sort you can imagine, and a few you couldn't (paper? glow in the dark? rubber jelly cord?). 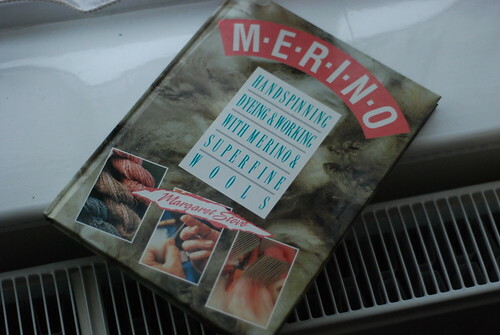 I could have spent hours wandering around, and certainly hundreds of pounds, but seeing as my yarn budget was running low I left the shop with just one precious book - Margaret Stove's book on spinning merino - which is out of print and which I've been wanting for quite some time. I returned home on the train, exhausted but very satisfied - with my purchases, with my experience being in London again, and with spending time with some lovely Ravelers.